Jonathan Juan was dunking his shrimp bait in 15 feet of water on the Hamakua Coast of the Big Island when the state record kupipi inhaled it. 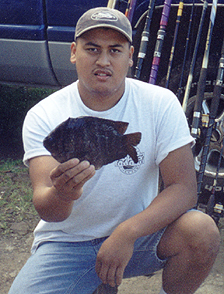 Jonathan's gray damselfish was caught on May 14, 1999 and it weighed a respectable 1 lb 9 oz. He was using a Penn 4300SS reel, 6-lb test line and a Fenwick pole.